Little activity has been going on in the Blount Street Commons area of downtown over the past year until recently. 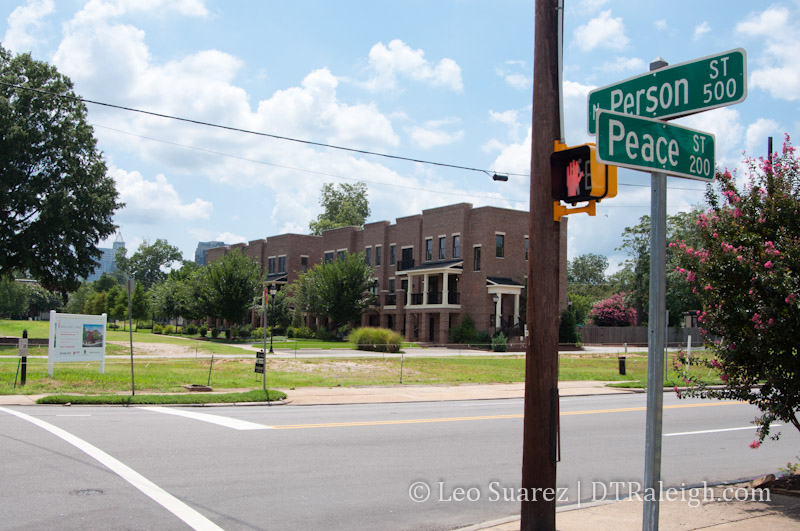 Peace Street Townes is bringing 18 townhomes to the corner of Person and Peace. If all goes according to plan, we’ll see dirt moving this fall and owners can move in Spring of 2013. Peace Street Townes is a scaled down version of what was originally planned for this plot along Peace Street. If you take a look at an older post in 2007, the plans called for “live/work over retail” development as well as a rendering of what it could look like. Things have changed since 2007 and while not as dense as planned five years ago, Peace Street Townes looks to deliver some new options to those interested in buying downtown. But you are right! Who would want to live 10 feet from busy Peace Street and the 24 hour noise of Krispy Cream? You actually get used to street noise and business noise pretty frequently. I’ve lived over restaurants that were open late into the evening and drunken kids stumbling around at all hours of the night. I agree on the design, it’s far from a quality brownstone design. I don’t think it’s the end of the world that there’s no retail, most brownstones aren’t part of retail developments and more residents in that area will be good. The design isn’t terrible. I mean its no grand central station , but it will help build a real urban neighborhood and help support the expansion of downtown. Over time when owners do remodelations and expansions of the site it will get more character and it will not only economically support the area but add to it ascetically. When are we going to see water features in downtown Raleigh incorporated in these developements!!!? I have never seen a downtown with almost NO water features and very little art on sidewalks, seating areas or in front of high rise structures. Come on Raleigh and developers, get out of the 1900 century. need more seating area and much wider sidewalks in downtown. Raleigh Times is laughable, they put a few tables and chairs out and your sitting in front of a car (with no room for people to walk the sidewalks unless they are in your meal!!!!!!! Enough of the Bull and waiting. City needs to get some “you know what” and tell that sad Empire Properties organization to FINISH the L Building ASAP. What an eye sore. City approved this guy to get $50,000 for a restaurant expansion, are you kidding!!!!!!!!!!! Who is playing footsy from city council with this guy. Anyone hear or see any current renderings of the hotel for the lot next to convention center? When is this project breaking ground? More hotel space is needed near that convention center. NO STUCCO for any more buildings downtown!! Especially this building. Sorry, that wasn’t meant to be snarky, I just seriously doubt we’ll get what you want from RI. What Raleigh really needs is Intercontinental or W or Four Seasons or another major luxury hotel developer to building something downtown. This is probably the only urban area in the top 50 that lacks a luxury hotel in the city center. Some of you people complaining about what’s going up should consider buying some property and developing it as you see fit. The entire Blount Street Commons project has been nothing but a disappointment for me. When the front of homes face the back of other homes, you know there is something wrong with that developer. Unfortunately, the city cannot do much, as it is the state government that gave the green light on this garbage. A better site plan would not have disappointed me that much. I actually like these and as a married 30 year old with no kids, I am looking to move somewhere downtownish in a non-rental. I don’t want a highrise tiny condo, and I’ve been looking in that neighborhood, so this is a possible option for me. I still might rather have a bigger space (they’re tiny for the price and have no yard), but it’s nice to see another semi-realistic option. As far as luxury hotels… do you guys realize how many people complain about the “hipster” restaurants downtown with $15 entrees, the couple bucks it costs to park some places, and the hotels not all being $60? I don’t see a Four Seasons getting much business. Almost no one rich comes to Raleigh just for leisure, and most businesses aren’t going to put their employees up in a 5 star hotel when there’s two Marriotts right next door. Jeff, I think you make a very valid point, there certainly are a lot of people who complain about ‘high’ prices, but my only counter argument will be that there are 3 luxury hotels in Chapel Hill, one in Cary and one in Durham. I realize Chapel Hill probably gets a fairly high number of wealthy Carolina alumni to come for sporting/university events, and the same with the Washington Duke, but if Cary can support the Umstead, I don’t see why Raleigh can’t support one. The Umstead actually bills itself as a ‘Raleigh’ hotel. I’m not saying Raleigh is going to be overrun with luxury hotels, I mean we’re not a big tourist spot, but as downtown adds more businesses and more entertainment options, I think it’s fair to assume that an upmarket hotel will become more viable. Personally, I wish to see Raleigh promoted as an affordable – not ultra cheap, though – destination, and I do not care if it gets high-end amenities. This is not Miami, Orlando, San Diego, NYC, etc. Why do we need high-end amenities? Maybe some time in the future it will be necessary, but until our downtown population reaches 15,000-20,000 residents and DT Raleigh begins to attract tourists (for whatever reasons), I will not envy other cities for their upscale amenities. However, I get angry whenever I see unattractive proposals getting approval, all because we allow ourselves to believe that we have no better options. Yes, we do have better options, such as standing up against greed and those developers who refuse to treat downtown as a second class citizen. If they can’t deliver the quality our downtown deserves, they should take a hike. I am not looking for expensive projects, but I expect some elegance, as well as see smaller projects ending up in transitional areas, not prime locations. Sorry, but I think you’re saying something that’s self-contradicting. If we’re supposed to be ‘affordable’ (we’re already affordable compared to most major cities), how can we expect anything other than crappy-looking buildings? Affordability is largely due to design and construction expenses. The better quality we get, the less ‘affordable’ it’s going to be, not least of all because attractive buildings are going to drive up property values, which drive up property taxes which in turn force prices up. This is pretty basic economics. You speak of elegance as if it’s affordable, but you’re well-traveled, Ernest, and you know the most elegant buildings and cities are either old and decaying, as is the case in various places in Europe, or they’re ‘restored’ or new and as a result, expensive. Steve, “affordable” is not synonymous with “cheap”. For instance, a brownstone can be sold for $500,000, while a similar one nearby may be sold for $450,000. The latter may be called affordable. The comparison is about similar structures and has more to do with the profit margin rather than the actual design. Here is a case scenario: City leaders may want to attract affordable – yet elegant – development in one of the city-owned lots. By giving some incentives to the developer, the price of the housing units may be reduced significantly, making them affordable for what they are. There have been many debates on the definition of affordability, and I have concluded that affordable has more to do with the actual value of the structure and less with the final price. Besides, $200,000 for a 1200sf home may be out of the question for many people, but what makes that home affordable is a combination of quality and location. Of course, we can “debate” this over and over, but at the end we have to put things in perspective, in which case we have to discuss location. My 2400sf home in North Raleigh is worth about $230,000. How many homes in the same condition can be found in DT Raleigh for, say, $300,000. None, I can assure you. The cost of the materials is the same, but location is what makes the difference. However, most people would agree that even $350,000 would be considered “affordable” for such home if it was located downtown. Your argument about getting cheap-looking designs is valid, but it shouldn’t mean crappy designs. Personally, I favor a mix of “affordable”, but nice looking homes, and high-end homes that have elegance and quality. This is kind of an aside: I posted a little while back about Skyhouse when I was looking at this site because I put in for a promotion in Raleigh and want to know what the city is like. I am still waiting to hear who’s been selected, so I am browsing this site again. As an FYI, Skyhouse Atlanta is now completely topped off, so if you can find a current photo, you will know what Skyhouse Raleigh will look like (assuming they are still building it). I wonder where a good place to live in Raleigh would be if I get my promotion…Glenwood South area? Adam, that really depends on what kind of place you want. Glenwood South has several apartment buildings that are near entertainment and walking distance to downtown (assuming you can walk 10 blocks or so).